Perched on the the bluffs of Mendocino Bay and directly facing Mendocino Village, Chapman Point House delivers a view that has been coveted by artists and sight-seers for decades straight to the comfort of your living room. Built in 1963 by a professor of architecture, every room has a stunning ocean and Mendocino view. The house is framed with awe inspiring 150 year old hand cut giant redwood beams (reclaimed trestle) and the flooring is 3" thick maple from a San Francisco bowling alley. Modern furnishings combined with a beautiful Redwood slab dining table and bar help make the house warm and inviting. The combination of rustic and modern elements make this a truly unique and special place. The main living area features a panoramic ocean view through which you'll be mesmerized by the ocean waves during the day and the twinkling lights of Mendocino at night. Stay in and cook in the fully equipped kitchen or sample some of the many fine restaurants in Mendocino. Chapman Point is also directly adjacent to Spring Ranch Park, letting it's guests explore miles of beautiful headlands and meadows sprawling all the way to Van Damme Beach. Whale-watch, bird-watch, hike, go tide-pooling or picnicking for hours and it's just steps from your front door. To see all photos and details visit our website. Please note: Children under 10 yrs. not allowed due to close proximity to the bluffs. The perfect location in an artistic cabin. My second stay! Mendocino Perferred wonderful to work with. The home was very clean with the perfect location. We loved being a little out of town where it was peaceful and quiet. We enjoyed see the twinkling lights of village of Mendocino across the bay. Enjoyed ten short days in this lovely interesting early use of recycled building materials in the spacious and very comfortable home. Our big thrill was the time spent watching the sea with each glance out the huge windows more beautiful than the last. One can truly say that view is better than anything you might ever see on TV...and the fireplace in the master bedroom makes me want to do a little remodel back at home. A wonderful, relaxing and delightful time in a perfect location!!! Amazing home with beautiful views and amenities. Total relaxation! There is a wonderful place over the rainbow and you'll find it at the Chapman House. This is our 4th stay here and we'll be back again. The Chapman Point House was everything we hoped for... wonderful architecture, great views, 5 minutes (or less) from the town of Mendocino. We'd been to Mendocino years ago -- the Heritage House -- this was so much more fun. Great service, too. Eat at Luna!!! We Fell in Love with Mendocino All Over Again! Chapman Point House is an architectural dream. Loved the windows, the layout, the well-appointed kitchen. The view is simply lovely. The couple who joined us this time also were smitten with the home, the view, and of course, the quiet, peaceful village of Mendocino. We had a great time!! 😊Our views could not have been better!! It was quiet and beautiful. Even the lot next to the house had a field of blooming pink flowers!! Beautiful location, however, the pellet stove was non-functional, making it cold in the living area. Otherwise it was great. I would ask the rental company to provide a single sheet with all information, including lockbox, that was buried in one of 4 emails received, and caused a bit of [panic when we initially arrived. A single sheet with ALL information would be extremely useful. Hello Susan, thank you for the feedback. Please know that if you ever have any issues at any of our properties, please know you can give us a call and we are happy to do what we can to get things fixed. In the case of the pellet stove, it was just a surge protector that had tripped. We are very sorry for the inconvenience and the cold living room. And thank you for sharing about the information regarding the check in process, we will take it into consideration. We are very happy you had a nice stay overall and thank you for being our valued guest. Spectacular house! Comfortable, relaxing, stunning! Great location and very well appointed house. Very peaceful and private. Mendocino is close by and there is lots to do in the area with some incredible views. We really enjoyed the Chapman home. It had great views of the ocean and it was very relaxing. The only downfall would be that the master bedroom bed was uncomfortable. Wonderful home we return to year after year. @nd bedroom bed is a bit small for 2 people and should be upgraded. This is the second time we’ve stayed at the Chapman house and it exceeded our expectations yet again! There is something very special about this place as it’s one of the only places were we can truly relax. Having a glass of wine or cooking in the kitchen with those breathtaking views is an experience I’m so grateful to be a part of. We’ll be back again! It was a very restful week in a beautiful home overlooking the town of Mendocino. The house was perched on the hill overlooking a lovely cove. We enjoyed sunshine and rain. We could have stayed another week. I hope we are able to return soon. This is a beautiful ocean view home with giant windows and tons of charm. The home itself was well-equipped and we really enjoyed our stay. I wish they had more than just a double bed in the guest bedroom, as it made for a difficult night's sleep, but otherwise the house was wonderful. The house is simply stunning, the setting sublime. I have absolutely no complaints and only praise. The kitchen had all implements necessary to a week spent cooking -- we only ate in town once. The fireplace and pellet stove were both dreamy, the hot tub so tempting we used it until we had rashes from the chlorine. So many gorgeous walks all around, whales and seals, redwoods, and a kaprillion sand dollars. Oh, and friendly women selling fish and crabs off their boat. We'll be back just as soon as we can. Our only request -- two egg cups, please! We rented the house for a few days in January to get some rest and do some local hiking. The house was perfect for the restful periods. Unfortunately it rained hard all 3 days and our hiking was very limited. Therefor we enjoyed sitting in the living room, listening to the rain and reading more than we had planned. The couches we very comfortable and the large TV was great to watch the Australian Open tennis. The kitchen was well stocked for cooking and the rooms were very clean. We really enjoyed sitting in the hot tub and looking out at the ocean (even in the rain). The Chapman Cottage shared the same driveway and is behind this house, so their views are limited. We were lucky that the cottage was vacant during our stay. We would definitely rent the house again. The agents were very helpful and kind. We have stayed here many times and it is always a wonderful experience. We loved the house. Adequately stocked kitchen, great to have a washer and dryer. Quiet and peaceful. The bed was comfortable. The view was spectacular both night and day, enjoyed the wildlife, seals, birds and, at night, the lights from Mendocino across the bay. The yard and the house are so beautiful. We really enjoyed Chapman Point It was cold so didn't use the hot tub but we relished the view through the floor to ceiling windows. Downside, the TV remote is very slow and selection is less than best. Not much problem since we were out and about a lot. Thanks for the cozy and pleasant stay. We stayed at the Chapman House in early December for a short get away. The location, architectural features and amenities made it hard to leave. We loved early morning and late evening hots tubs, reading by the pellet stove at night and cooking in the well-appointed kitchen. Views of Mendocino and the beautiful Pacific Ocean from every window made every moment memorable. This was our third stay. Our only concern is loosing the view because the pine tree that is to the left in your picture is slowly causing the view of the white water and part of the town to disappear. The view is much less now than our first stay three years ago. That pine tree really needs pruning.Your picture is now somewhat decieving. Other than that, the place and the location is wonderful - jut fabulous. We have stayed several times. Great location and a favored location. Maintenance and cleanliness were off a bit. Everything was awesome. We've stayed here before and will again. House is in great shape and very cool design. Location is perfect. Everything about this place was great! The hot tub was a little too hot and seemingly unable to be adjusted, but that could have most likely been remedied with a call to property management. The only thing we could have asked for would be that the overlook deck on the lower ridge be fixed so it could be used to take in the fantastic views. Overall the property and views are beautiful! We would return to enjoy this place again. Very nice house, beautiful location, well equipped. My husband and I decided to book this property for a long weekend to celebrate our anniversary. Both of our reactions when we walked into the home was wow!!!! The views from this property are unbelievable. The fact that there is an outdoor Jacuzzi that you could see the views from is just another cherry on top of the pie. The kitchen is very well-stocked and I was able to cook several meals with no problem. 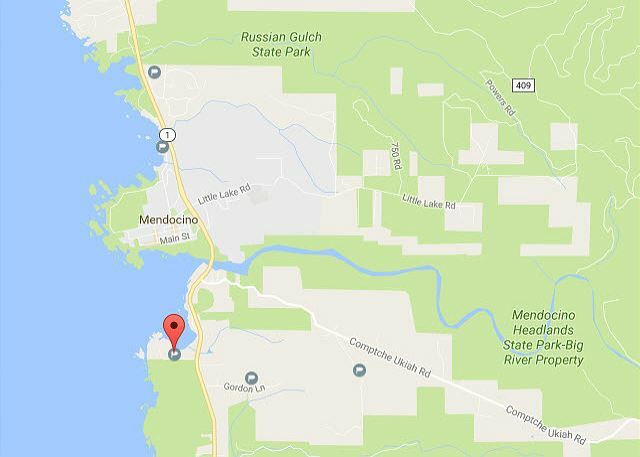 The location is in very near proximity to the town of Mendo and is centrally located for exploring in general. The only negative comment I have is that I wish we booked a longer stay. My husband and I will definitely be coming back to this property again. It's the most lovely VRBO we've rented to date. We've stayed here a number of times. It's a lovely, interesting house in a wonderful location. We will return again and again. We love the house and the view. This is the third time we've stayed here and will return at Thanksgiving. The house is spotless and the view is magnificent. Your picture says it all. Excellent kitchen & living room...comfortable and cozy ! Outrageously beautiful location, exactly as advertised. Very clean and very well equipped for our stay. Overall experience was excellent, would love to do it again! Vacation home was in great shape, very clear, and the extra touches provided by Mendocino rentals was very much appreciated. Great location and an amazing house. We will be back next year. Absolutely stunning view, location, and home. The home is just minutes from town, but far enough to be quiet and serene. The home is immaculately maintained and well stocked with cooking items and all the basics. Beautiful home, beautiful view, attentive staff. Overall a wonderful experience. The bed in the 2nd bedroom is quite small - would have been nice to know that, as really more comfortable for one person. Located just across the harbor from scenic downtown Mendocino this two bedroom satisfied our wish for views inside and out. A wall of windows greets you as you step into the house and the architectural design is very pleasing and contributes to a relaxing atmosphere. There is a deck closer to the edge of the overlook but it is closed for safety reasons. Hope it gets fixed soon. A big plus to the location is its easy access to a path that leads to the ocean and Van Damme State Park. Perfect View and So Comfy! The house was perfect. Everything worked great, was extremely tidy and the pictures don't do it justice. The grounds are amazing and we had the best time. Beautiful property. History very interesting. A quick jaunt with the family for spring break. Kids loved the place and beach access nearby was great. Bowling alley lanes for flooring throughout the house is unique. Some dated fixtures but overall in good shape. My wife and I spent a fantastic 3 nights at Chapman Point House with our two dogs and had an excellent time. The home, the setting, the amenities all worked together to make this a go-to getaway spot in the future. Relaxing weekend, great location, beautiful, unique and comfortable home, but terrible weather.. Everything was great and as advertised, but outdoor activities were minimized this time around. Classic 60s-70s designer home. Loved the history, location and views from the giant windows. We have stayed at the Chapman Point House every year for the past 7 years and it never disappoints. 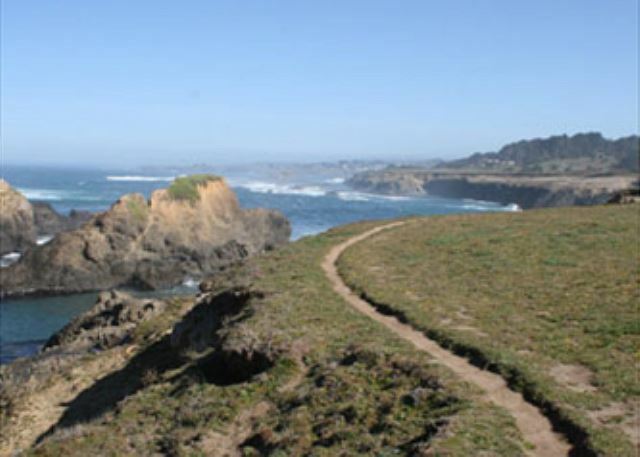 The location is perfect for us, especially the short drive to the town of Mendocino. The views are fantastic whether it is sunny or storming, day or night. The folks at Mendocino Preferred are always very friendly and accommodating. We would definitely recommend this home for a stay on the Mendocino coast. Everything was perfect. The fact that we were able to bring our dog was icing on the cake! Spent a week at Chapman Point House in November of '16. 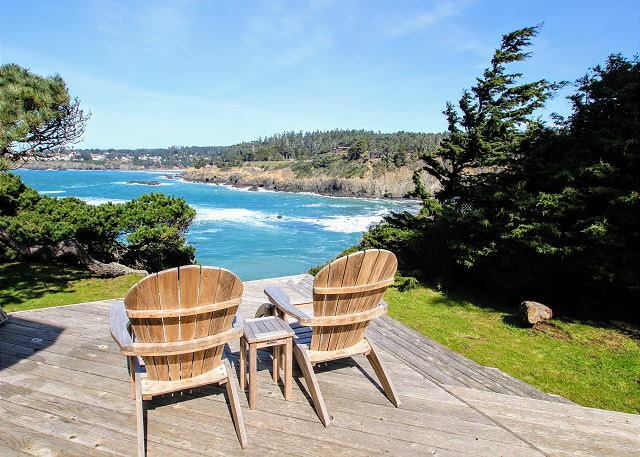 The location is perfect - across the bay from Mendocino with views that are second to none. House is architecturally interesting and well stocked. Pretty Private. Great Hot Tub. We saw our own rainbow one day and it was magical. We have stayed in many vacation rentals, but I cannot think of any that compare in comfort and beauty to Chapman Point House. To whomever designed the place: you managed to strike a balance in which I found myself alternating between deep relaxation and the thrill of living amongst gorgeous weathered wooden beams and stunning ocean views. Will you come design my home? The rental company went the extra mile by purchasing and delivering a card table when we requested an extra work space. All around superb experience. Great location and charming home. Perfect place for a family coastal getaway! beautiful location, extraordinary architecture, quiet, lovely, comfortable, delightful,and wonderful time in this very cool house. My only hesitancy is telling everybody this because I don't want it taken the next time I come to the coast! The views from this home were absolutely wonderful - the cove, the cliffs, the ocean and the town of Mendocino. If that weren't enough, our party was captivated by the architecture of this home. The large hand-hewn beams were stupendous! The floor to ceiling windows in the great room and multiple windows in all rooms, made it light and airy indoors and brought the land and water all around us inside, as well. The decking in the front and oceanside beckoned each time you looked at it. The amenities of this home were more than sufficient for our needs. We so recommend Chapman Point House. We had a great time at Chapman Point House. Very peaceful and relaxing. The house is very comfortable and the view from the hot tub is amazing. We had the most amazing mini vacation at the Chapman house. The house is amazing and the views breathtaking. We had a couple of minor issues (with the DVD player and pellet stove) but the maintenance man was there within 15 minutes of our call, and had it all taken care of. He was great! The entire rental staff was so helpful, and friendly. Loved the hotub (and the jacuzzi tub), and was able to get lots of much needed relaxation. We cannot wait to go back! Loved the home and views. However, I would say the home needs a little TLC. Both fireplaces were not working, which was a downer for our romantic getaway. Also, the home had a horrible must/water smell. I'd strongly encourage the owners to get a dehumidifier to resolve odor problem. Lastly, I thought the living room furniture was not that comfortable. For the price per night of Chapman House, I'd expect a much more comfortable couch that can accommodate 4 people easily. Maybe even six, if you have friends visiting from the cottage. I mean that is what the living room in this home is all about. Kicking back and enjoying the amazing water view. Tough to fully appreciate from a small, slippery, dated leather couch. Overall, the home and setting are unmatched, but I do think the issues I mentioned need to be addressed for the premium price paid for this rental. My husband and I stayed here and we both completely loved this house and it's amazing views. The home had a wonderful peacefulness about it and we greatly appreciated the repurposed building materials. The property management company is very easy to work worth and obviously on top of the care and maintenence of their properties. I miss this place so much. I loved sharing my weekend with my husband at this house. It was on our bucket list. I loved it. I would love to return, but who knows. The bed was super comfy, the shower was great. Good central heating, beautiful kitchen and living room. The only thing i did not care for was the leather couch. Other than that, this house had me in tears, it was so breathtaking. I did not want to leave. We loved the house and location, but were not able to enjoy 1/2 our time there because the power was out due to the weather, which made it uncomfortable, dark, and cold. Staff and owner were very helpful and concerned. Very serene and private. Perfect for a romantic getaway.Could benefit from putting a propane stove in the Master Bedroom instead of a fireplace with a sign that states, "Do Not Use". We could not have been more happy with our stay at the Chapman Point House. The view, the architecture, and the amenities were top notch. We will definitely be back when we need some quiet time. We had a wonderful time in Mendocino and we thoroughly enjoyed our stay at the Chapman House. We loved the Chapman Point House. The views were breathtaking! When can you enjoy sitting in a hot tub overlooking the ocean? The house was roomy and clean, and it was a nice touch to add a Happy Birthday banner for those of us who were celebrating. I highly recommend this location. This is a great place to stay in Mendocino! If you want to be enveloped in scenic beauty then Chapman Point House should be your choice for a vacation rental! Not only is it close to the ocean (just feet away!) but its only a mile from "downtown"... The windows in this house offer amazing views -- from the guest bathroom to the master bedroom and everything in between... You will not regret your decision to stay here if you're looking to escape into nature. The location of the home is absolutely magical with spectacular views! The master bed was very comfortable and the master bathtub perfect! I did appreciate the architecture of the home. Needs garden maintenance!! Couch needs fixing. Back pillows no longer hold to back by Velcro. Needs new Velcro. They immediately slide down before one can sit. Master shower/tub difficult to enter/exit by anyone over 60 who is not tall. House is gorgeous but need a little TLC. Love the rental company. I am a return client to Mendocino Preferred Vacation Rentals. I have rented from many agencies, and found them to be the best by far. First of all the price they show is including all the fees, most aren't. They have the best customer service I've seen. We loved this home! You can't beat the view, looking across the water to Mendocino! It's perfect with the wall od windows facing the beautiful ocean. We enjoyed everything about our stay. Our stay was wonderful. The house and surrounding property was beautiful and serene. We sat in the living room one afternoon and watched a family of deer grazing on the hillside. Earlier that morning it was a pair of wild turkeys. The kitchen is decently appointed and we picked up supplies in Mendocino and cooked a lovely dinner. The beds and furniture are all comfortable, and the wood burning (pellet) stove in the living room was comforting on the cold windy nights. We will definitely be returning for another stay in the near future. We missed whale watching season this year, but plan to get back in time for it next year. Amazing house, amazing view. Loved all the reclaimed material throughout the house. The open space park hiking out the back door was wonderful. Our dog loved the place too. She did not want to go home, neither did we. We will be back! Property is amazing. Mendo Preferred does an excellent job of taking care of its guests and the house. My wife and I have had the pleasure of staying a few times now and it's always a perfect, restorative getaway! A great vacation home with great view! An architectural beautiful that is comfortable, cozy and relaxing. The view of the ocean and cove is amazing. Simply the best! Great for two couples and is close and convenient to everything. We have visited Mendocino more than a couple dozens times staying at various B&B and vacation homes and this is one of the best places we have ever stayed. Headed to Mendocino for Whale Fest and was not able to get the property we wanted. Mendocino Preferred said the property next door was available...Chapman Point House. Still the great location we were wanting overlooking the bay. Being on the water is a must! We had 4 days of Mendocino Coast beauty, decompression and fun. The property was the perfect size, nice and clean too. If you cook in, suggest that you bring some of your favorite spices with you. If you don't mind a drive, head up to Pacific Star Winery, north of Ft. Bragg, you will not be disappointed with the location. Eating in the bar at Little River Inn is perfect not only for the food, but sunsets too. We will definitely use Mendo Preferred for future getways! Thanks much. I have stayed at Chapman Point House three times now, and each time the experience has been superb. The house is spectacular, with amazing views, and the location a couple miles south of town is very peaceful AND convenient. The kitchen is very well-equipped, and the house is always spotless. Management staff has been very helpful and thoughtful. I will be back! experience of the local region than hotels. This home was truly perfect for Mendocino. Architecturally stunning, views to die for, perfect hot tub setting, all the amenities, location right in the center of town, comfy beds! Quiet and peaceful. Beautiful views. We have stayed here for a long weekend every year for the past 6 years-so yes, we love it! The views are fantastic from the floor to ceiling windows overlooking the ocean. The property is always clean and very well maintained. The staff at Mendocino Preferred is always friendly and helpful. We'll be back again next year! This was our second stay at the Chapman Point House. We stayed here last year and liked it so much we re booked for the same time period again. The house is ideally set up for two couples, with bedrooms on opposite sides of the house, and in between there is a kitchen/dining room/living room with high ceilings and a stunning view. The pictures do not do it justice. The kitchen has plenty of cooking equipment and if you want to go out for dinner etc. the house is only a couple of miles from Mendocino via the main highway. This time we also used the hot tub, which was fantastic with the full moon. We highly recommend this home and will stay again. I should also say that the property managers could not have been more helpful and easy to deal with. The four of us had a great time at the Chapman Point House. It is a beautiful well appointed house on top of the bluff overlooking the town of Mendocino. The spacious kitchen and dining room became the focal point of our evenings as we chose to wine and dine at "home" rather than dining out. We lucked out with the weather as well .. allowing us to go on hikes in the trails and walks on the beaches. We have already spread the good word to our friends and family and will definitely be back ourselves. Lovely house with a great view and an ideal location. We can't possibly be more positive about it. Perfect for two adult couples. Outstanding property. Everything we expected. Should have stayed longer. Will be back. My husband and I spent a week at Chapman Point House and loved our time there. From hanging out on the deck overlooking one of the most beautiful views in Mendocino to cooking delicious dinners in a perfectly appointed kitchen, we couldn't have asked for anything more. Even though the home has wifi, we completely disconnected from our gazillion devices and walked away rejuvenated. We will certainly be back! Chapman point house is beautifully designed and nicely appointed. 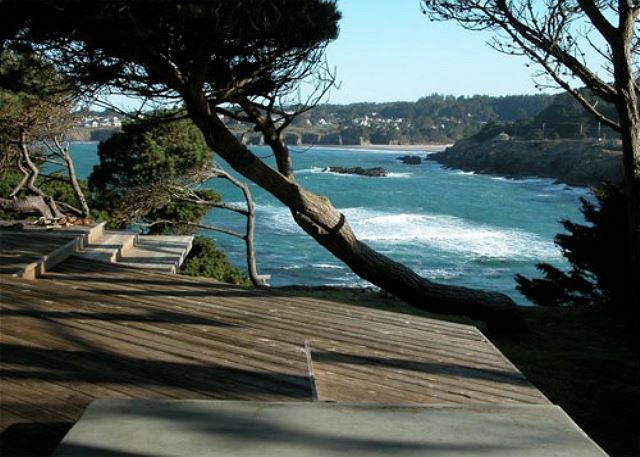 The design and siting of the house is ideal for enjoying the magnificent views of the water and Mendocino. The appliances, kitchen gear, furniture and art work were all very nice well suited to the house, making it easy to feel at home. The location was perfect for us as we wanted a quiet spot right on the water and didn't want to be right in town. I biked into Mendocino which was only about a mile away and there was a back route with little traffic most of the way. We look forward to returning. This is a beautiful, unique property that was clearly designed by someone who wanted to make an architectural statement. And they succeeded. It is a great place for a couple getting away. You could bring kids but you would need to watch them along the cliff. Location to Little River Inn and Mendocino is great; furniture is not that comfortable. So five stars for location, two stars for furniture and four stars for other amenities = four stars overall. We are torn between honesty and deception! Our 2nd time - Fabulous, quiet, comfortable, architecturally fun, views, kitchen, privacy, on-and-on-and-on. Our stay at Chapman Point House was most enjoyable. We enjoyed the views from every vantage point in the house. It was very comfortable, clean and well maintained. We enjoyed several of the restaurants in Mendocino and Fort Bragg. The local grocery was well stocked for any items we needed or wanted. I would recommend this location to anyone who wanted to visit. The serenity and beautiful view gave us a perfect vacation. Beautiful home, amazing views! We will be staying here again.